One of the finest joys of living on Long Island is being able to revel in seaside bliss with beaches, boating, and fresh seafood. Combine these luxuries together, and you have a romantic dockside dining experience! There are many restaurants located right on the water that have the added benefit of a marina where you can dock your boat and be only a few feet away from a unique dining experience. Many of these restaurants are seafood themed, but you can also find great grills and bars for American and Fusion cuisine. Most of these eateries post directions to reach them both by boat and by land so that any of your hungry landlubber friends can meet you wherever you are - whether you go to Rachel's Waterside Grill on Freeport's Nautical Mile, or you hike out to Gulf Coast Kitchen in Montauk. 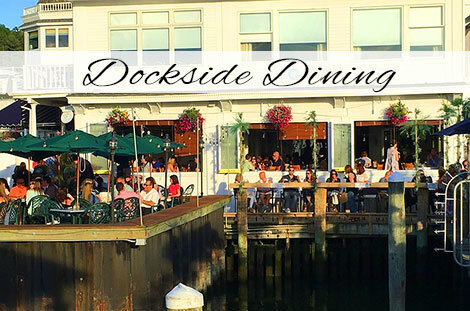 These dockside dining experiences span the North Shore and South Shore, so there is bound to be something close enough for a quick night out, or for a beautiful summer day trip. Take your boat out on the water this summer and bring your friends and family to one of these great restaurants! Overlooking Patchogue River is this groovy restaurant, where you can put your feet in white sand, sit under a palm tree, and enjoy live some live music. You can also look forward to more Hawaiian motifs, including pig roasts and luaus! Take a trip to Freeport's Nautical Mile and enjoy fresh and creative seafood dishes at Rachel's, which is open for brunch, lunch, and dinner.